Institute located close to the meeting point of Chembarambakkam channel and Adyar river; locals allege that lives of students will be at stake if a repeat of 2015 occur. 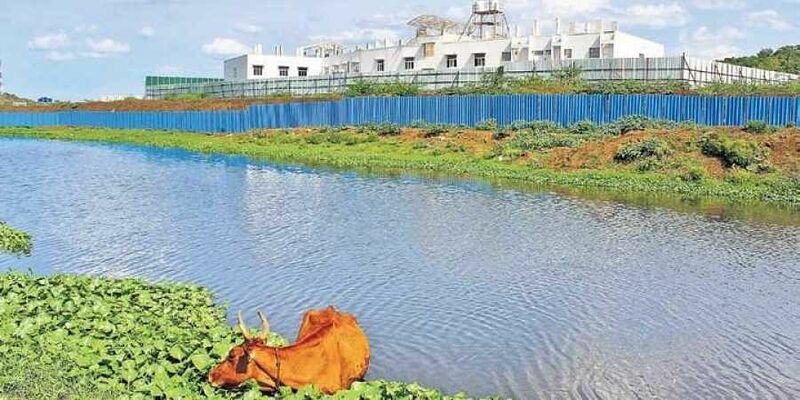 CHENNAI: A private school has come up on the banks of the Adyar river, just metres away from where excess water released from the Chembarambakkam lake entered Thiruneermalai in December 2015 before rushing on to flood the Tambaram area. As the monsoon is not far away, local people allege the school is flirting with danger and risking the lives of its students by operating in a high-risk flood zone. “The school is situated at the junction where an outlet channel of the Chembarambakkam lake and the Adyar river meet. This means if water is released from the lake, the school will be the first building to be hit,” said O Udayakumar, a resident of Thiruneermalai. According to locals, the entire area right upto the base of the nearby hill, which is, at least, one km from the school, was submerged in water upto the first floor of several buildings during the 2015 floods. This means a repeat could completely submerge the school which is just a stone’s throw away from the Adyar river and the Chembarambakkam water channel. Interestingly, the school seems to have sacrificed ‘safety for the aesthetics’. The school buildings have been constructed right next to the river bank instead of the other extremity, which would allow some breathing space in case of emergency, though disallowing the picturesque view it boasts of now. Though construction works were completed last year, this primary school began functioning only two months ago with a strength of 50 students and is affiliated to the Central Board of Secondary Education. When Express contacted the school’s management over the issue, they downplayed the risks the school faces from flooding. “We have raised the floor two metres and will build a four-metre compound wall,” said an official, claiming the school’s basement has been sealed as a safety measure. However, locals, who witnessed the flooding in 2015, said that no wall would stand a chance of fighting the raging water. “Everyone just remembers 2015 because it is the most recent incident of flooding. At least, once in five years, there is flooding. It is more common than people think,” said Udayakumar, adding that the monsoon doesn’t even have to be as bad as 2015 to cause flooding.